In 1849, James B. Francis, an American engineer, set out to improve upon the design of the few hydraulic turbines then operating in France and the United States. Most of the earlier turbines were so constructed that the water entered their runners at the centre and flowed radially outward. The turbine that Francis built following his investigations allowed the water to enter the runner from the outside and to flow inward through the radial blades. This type of turbines is similar to Kaplan turbines, except their shaft position which is not vertical, but either horizontal or inclined. 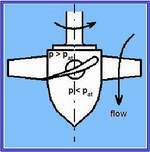 In the impulse type of hydraulic turbines, the runner converts the kinetic energy in one or more jets of high-velocity water into torque in the turbine shaft. The runner consists of a definite number of buckets, each of double-bowl construction, located on the rim of a central disc. The Kaplan turbine is generally the most suitable type for low-head and medium-head installations where large variations of flow and head are encountered. The distinguishing feature of a Kaplan turbine is the automatic adjustment of the angle or pitch of the runner blades as water flow or power output varies.